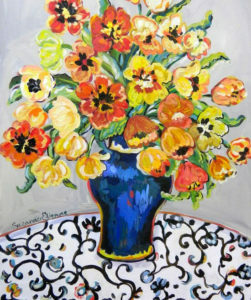 Suzanne is known for her vibrant and colorful paintings of summer cottages, vistas, farms, fowl, or woodland creatures. 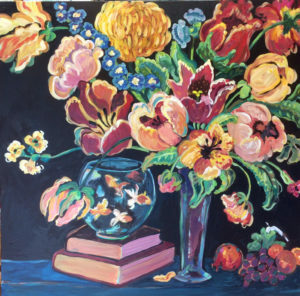 In this June’s gallery show, “In Full Bloom,” Etienne will showcase the beguiling beauty of flowers, in vases, teapots or gardens, incorporating bold patterns, fabrics, and wallpapers – All bringing humor and joy to her work! Cheryl has hand-built fun clay flowers that can hang on walls inside or outdoors. Each piece has been fired in the kiln to over 2000 degrees. She has also been exploring cutting metal with a plasma torch. 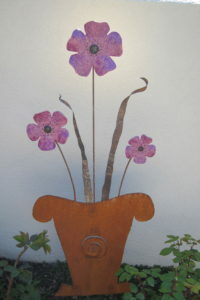 Both clay and metal flowers have been incorporated into rusted steel art pieces for the garden. 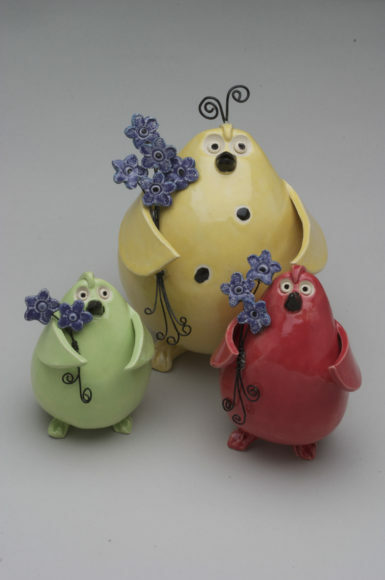 Of course, Cheryl’s “Crazy Birds and Friends” will add whimsy and bright colors to this show. Please visit Ashland Art Works and delight in the unique work of fourteen local artists. Stroll through our 5 galleries on the property and see woodworking, functional clay, wire sculpture, assemblage, paintings, woven textiles, garden art, silks, photography, jewelry, cards and more.